I hope you’re all having a fantastic Sunday! 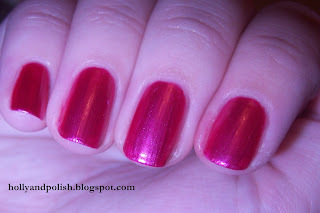 I’m about to run out the door to go babysit, but I figured I would quickly post some info about the polish I’m wearing today. 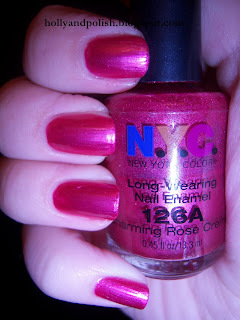 Today, I’m wearing Charming Rose Creme by NYC . Charming Rose Creme is a hot pink rose color. I actually think this color is really pretty, but I have no idea why they labeled this as a creme. (It’s more of a frost) This one was kind of hard to apply and is really streaky. I ended up using three coats of it just to try to get rid of some of the streakiness. (Adding an extra coat than what I normally would helped a little bit, but not much) Even though it's really streaky, I still like it it. This one only cost me 99 cents.